Canine Front Leg Wrap | Labra Co. The Labra Canine Front Leg Wrap is the perfect solution if your dog is suffering from limited mobility. This neoprene compression wrap provides stability and support to your dog's front legs without compromising flexibility. It can be used to help dogs heal from joint injuries. This wrap can also be used as a preventative measure for elderly dogs which are at a higher risk for injuries. Because the brace is made of strong, yet soft and flexible neoprene, the brace will always be comfortable on your dog's leg. Fight back against mobility limiting joint conditions such as arthritis with the Labra Canine Front Leg Wrap. As your dog ages, their joints will naturally deteriorate, just like they do in humans. This wrap is an easy to use, and more importantly, comfortable option for dogs that need a little help with stabilizing and supporting their front legs. MOBILITY: Don't let your elderly dog suffer from limited mobility. Support weakened joints and muscles with our front leg wraps. JOINT CARE: Arthritis and joint injuries limit your dog’s mobility. Give your dog the extra support they need to continue enjoying their happy and active life. VET APPROVED: Our brace meets and exceeds the high expectations of certified veterinarians. USE INSTRUCTIONS: Remove brace every 2-3 hours and at night to allow leg to "breathe"
SIZING: See Photo section for sizing information. They need to be a bit heavier weight for more support. My Mastiff Puppy had one leg that turned in slightly, (not to be confused with knuckling over). These wraps and good nutrition are what gave him the nice, straight, legs he has today. I ordered the wrong size and was sent the correct size immediately. I am normally skeptical about emailing a place to ask for a return, but I was responded to by a human and instead of asking me to return the too small wraps, Noah asked me to donate them to my local shelter! I was more than happy to do so. I got my new fitting correctly wraps and my puppy wears them when he is active. I truly believe they were a big help to him. Though only one leg turned in, I got two wraps so that he didn't over compensate on the other leg. This is perfect for supporting my dogs ankle joint that had been injured. My dog is a country dog walking leach free, in to the woods and tall grass. One of the front leg wraps came undone and is now lost. This morning while walking on a blacktop road the other one came off. Fortunately we found it on the way back on our walk. For some reason the velcro closure does not adhere very well on the front leg wraps. I accidentally ordered two and I only needed 1 plus the second one was for a left leg and that leg is fine. Item came just as described, and on time. Very pleased with item and service. Highly recommend Labra and this front leg brace. My Border Collie does a lot better with the wrap than without. It also stays on good if it's put on the right way. He wears it all day and I take it off before bedtime...he doesn't really seem to mind it at all. Thanks for making a good product. Wrap needed. better support for my Pug. It helped a little but kept slipping down it was as the right length. Very satisfied with this product! Lightweight and helps support my pugs front leg that he has strained over the years from jumping off of beds and sofas! Delivery of this product was fast and efficient; price was amazing too! Iris Behr said: Best help for my old boy! Our 13.5 year old Norwegian Elkhound has severe arthritis in his elbows and both front legs “buckle” on uneven ground. Since we got him the braces, he is stable and loves to go on his favorite trails again. Thanks for such a great invention! I am pleased with my purchase of front leg wraps for my older coonhound with front ankle problems. He is able to walk outside 3-4 times farther now and acts like a puppy when I put them on. They help prevent over extension of the ankle. Great product, doesn't cause dogs foot to swell when on snug. Seems like good product, but won't work for my dogs problem. Her legs bent forward bad at joint, almost flat. Thought maybe these would help her out. But the do seem like we'll built products. 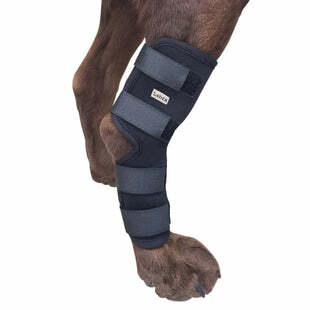 This brace is well made, easy to put on and had improved my dog’s mobility greatly. I would definitely buy it again. Although the wrap is a little smaller than I thought it would be, it works perfectly to support her carpel bones and the wrist joint. I have a happy Mastiff now who can take her walks without pain and collapse. We have a 120 pound malamute that rolled her front joint chasing a turkey. This is a great solution to support her stretched tendons and ligaments so she can still go for walks while it heals. Robbi Beck said: Great support!! The brace gives excellent support for my little tripod. I DO like these braces. My dog is a big boy who walks pretty hard & forcefully on walks so I am re-ordering these braces about once a month because I feel that the Velcro stops sticking as good. But since they’re not too expensive, I feel ok about this. I HAVE to have the support for his front legs. ACB said: Very good quality wrap! This is a very well made quality wrap. We bought both sizes s/med & lg/xl for the canine front leg wrap. Unfortunately, our old lab is dab in between these two sizes. Needless to say, it did not work out for us. No complaints what so ever, about shipping, ease of use and quality of this product. Thank you! Ultimately, the product has not stopped his front legs from collapsing, so it's back to the drawing board. But it is well made. I got this for my 7 year old labrador after she developed a fluid-filled lump on her wrist after a play related injury. Once I got it positioned correctly, her limp went away and the lump is slowly subsiding. She also has her stamina back and is able to keep up with her younger brother again. I think with time and repeated use her injury will heal without having to overly restrict her activity. I would highly recommended this brace to anyone with an active dog! This is a great tool for leg support for a dog. My problem was and is bigger than that, my dog needs surgery which cost me about 4 grand. Either way, this product is good and the man company stands by their gear with fantastic support, the kind of support that hurts the seller it is so good. Nice to know reputable companies like this one. I have a 3yo rottie with a deformed front foot, it turns out badly. I wanted something to give her added stability as she ages. I put the brace on her and it fit and she got up and walked away without bothering it. shows me it is comfortable for her. it is just what I wanted . service was awesome.